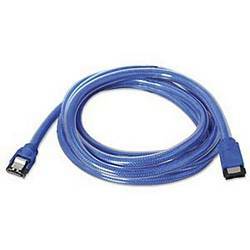 Use this eSATA cable to attach a SATA drive or enclosure to your PC. It has an "I"-type eSATA connector at one end and an "L"-shaped SATA connector at the other. It's rated for 3Gbps.